The Afghan Northern Alliance, officially known as the United Islamic Front for the Salvation of Afghanistan (Persian: جبهه متحد اسلامی ملی برای نجات افغانستان‎ Jabha-yi Muttahid-i Islāmi-yi Millī barāyi Nijāt-i Afghānistān), was a united military front that came to formation in late 1996 after the Islamic Emirate of Afghanistan (Taliban) took over Kabul. The United Front was assembled by key leaders of the Islamic State of Afghanistan, particularly president Burhanuddin Rabbani and former Defense Minister Ahmad Shah Massoud. Initially it included mostly Tajiks but by 2000, leaders of other ethnic groups had joined the Northern Alliance. This included Abdul Rashid Dostum, Mohammad Mohaqiq, Abdul Qadir, Asif Mohseni and others. The Northern Alliance fought a defensive war against the Taliban government. They received support from Iran, Russia, Turkey, India, Tajikistan and others, while the Taliban were backed by Pakistan. 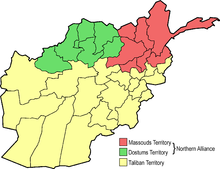 By 2001 the Northern Alliance controlled less than 10% of the country, cornered in the north-east and based in Badakhshan province. The US invaded Afghanistan, providing support to Northern Alliance troops on the ground in a two-month war against the Taliban, which they won in December 2001. With the Taliban forced from control of the country, the Northern Alliance was dissolved as members and parties joined the new establishment of the Karzai administration. The United Front was formed in late 1996 against the Taliban government by opposition factions. Since early 1999, Ahmad Shah Massoud was the only main leader able to defend his territory against the Taliban, and as such remained as the main de facto political and military leader of the United Front recognized by members of all the different ethnic groups. Massoud decided on the main political line and the general military strategy of the alliance. A part of the United Front military factions, such as Junbish-i Milli or Hezb-e Wahdat, however, did not fall under the direct control of Massoud but remained under their respective regional or ethnic leaders. From central Afghanistan: Sayed Mustafa Kazemi, Said Hussein Aalemi Balkhi, Akbari, Mohammad Ali Jawed, Karim Khaili and Sher Alam. Afghanistan after the Soviet retreat. Shura-e Nazar/Jamiat-e Islami (blue), Hezb-e Wahdat and Harakat-e Islami (yellow), Ittihad-i Islami (violet), communist groups including Junbish-i Milli (red), Hezb-i Islami Gulbuddin (dark green), Hezb-i Islami Khalis (white-green striped), Harakat-i Inqilab including many later Taliban (light green). Conflict between the two militias soon escalated into a full-scale war. Meanwhile, southern Afghanistan was under the control of local leaders not affiliated with the central government in Kabul. In 1994, the Taliban – a movement originating from Jamiat Ulema-e-Islam–run religious schools for Afghan refugees in Pakistan – also developed in Afghanistan as a politico-religious force. In November 1994 they took control of the southern city of Kandahar and subsequently expanded their control into several provinces in southern and central Afghanistan not under the central government's control. In late 1994, most of the militia factions which had been fighting in the battle for control of Kabul were defeated militarily by forces of the Islamic State's Minister of Defense Ahmad Shah Massoud. Bombardment of the capital came to a halt. The Islamic State government took steps to restore law and order. Courts started to work again. Massoud tried to initiate a nationwide political process with the goal of national consolidation and democratic elections, also inviting the Taliban to join the process but they refused as they opposed a democratic system. The Taliban's early victories in 1994 were followed by a series of defeats that resulted in heavy losses which led analysts to believe the Taliban movement had run its course. At that point Pakistan and Saudi Arabia drastically increased their support to the Taliban. Many analysts like Amin Saikal describe the Taliban as developing into a proxy force for Pakistan's regional interests. On September 26, 1996, as the Taliban with military support by Pakistan and financial support by Saudi Arabia, prepared for another major offensive against the capital Kabul, Massoud ordered a full retreat from the city. The Taliban seized Kabul on September 27, 1996, and established the Islamic Emirate of Afghanistan. Ahmad Shah Massoud and Abdul Rashid Dostum, former enemies, created the United Front (Northern Alliance) against the Taliban that were preparing offensives against the remaining areas under the control of Massoud and those under the control of Dostum. The United Front included beside the dominantly Tajik forces of Massoud and the Uzbek forces of Dostum, Hazara troops led by Haji Mohammad Mohaqiq and Pashtun forces under the leadership of commanders such as Abdul Haq and Haji Abdul Qadir. Notable politicians and diplomats of the United Front included Abdul Rahim Ghafoorzai, Abdullah Abdullah and Masood Khalili. From the Taliban conquest of Kabul in September 1996 until November 2001 the United Front controlled roughly 30% of Afghanistan's population in provinces such as Badakhshan, Kapisa, Takhar and parts of Parwan, Kunar, Nuristan, Laghman, Samangan, Kunduz, Ghōr and Bamyan. Due to the involvement of Indian intelligence (RAW) in supporting the Northern Alliance, Pakistan looked to neutralise this threat by cultivating the Taliban. In 2001 alone, according to several international sources, 28,000–30,000 Afghans, which took refuge in Pakistan during Afghan jihad, 14,000–15,000 Afghan Taliban and 2,000–3,000 Al Qaeda militants were fighting against anti-Taliban forces in Afghanistan as a roughly 45,000 strong military force. Pakistani President Pervez Musharraf – then as Chief of Army Staff – was responsible for sending thousands of Pakistanis to fight alongside the Taliban and Bin Laden against the forces of Ahmad Shah Massoud. Of the estimated 28,000 Afghan refugees returned from Pakistan fighting in Afghanistan, 8,000 were militants recruited in madrassas filling regular Taliban ranks. A 1998 document by the U.S. State Department confirms that "20–40 percent of [regular] Taliban soldiers are returned Afghans from Pakistani refugee camps". In 1998, Iran accused Pakistan of sending its air force to bomb Mazar-i-Sharif in support of Taliban forces and directly accused Pakistani troops for "war crimes at Bamiyan". The same year Russia said that Pakistan was responsible for the military expansion of the Taliban in northern Afghanistan by sending large numbers of Pakistani troops, some of whom had subsequently been taken as prisoners by the anti-Taliban United Front. In 2000, the UN Security Council imposed an arms embargo against military support to the Taliban, with UN officials explicitly singling out Pakistan. The UN secretary-general implicitly criticized Pakistan for its military support and the Security Council stated it was "deeply distress[ed] over reports of involvement in the fighting, on the Taliban side, of thousands of non-Afghan nationals". In July 2001, several countries including the United States, accused Pakistan of being "in violation of U.N. sanctions because of its military aid to the Taliban". In 2000, British Intelligence reported that the ISI was taking an active role in several Al Qaeda training camps. The ISI helped with the construction of training camps for both the Taliban and Al Qaeda. From 1996 to 2001 the Al Qaeda of Osama Bin Laden and Ayman al-Zawahiri became a state within the Taliban state. Bin Laden sent Arab and Central Asian Al-Qaeda militants to join the fight against the United Front among them his Brigade 055. With the fall of Kabul to anti-Taliban forces in November 2001, ISI forces worked with and helped Taliban militias who were in full retreat. In November 2001, Taliban, Al-Qaeda combatants and ISI operatives were safely evacuated from Kunduz on Pakistan Air Force cargo aircraft to Pakistan Air Force bases in Chitral and Gilgit in Pakistan's Northern Areas in what has been dubbed the "Airlift of Evil". The role of the Pakistani military has been described by international observers as well as by the anti-Taliban leader Ahmad Shah Massoud as a "creeping invasion". The "creeping invasion" proved unable to defeat the severely outnumbered anti-Taliban forces. According to a 55-page report by the United Nations, the Taliban, while trying to consolidate control over northern and western Afghanistan, committed systematic massacres against civilians. UN officials stated that there had been "15 massacres" between 1996 and 2001. They also said, that "[t]hese have been highly systematic and they all lead back to the [Taliban] Ministry of Defense or to Mullah Omar himself". Al Qaeda's so-called 055 Brigade was also responsible for mass-killings of Afghan civilians. The report by the United Nations quotes eyewitnesses in many villages describing Arab fighters "carrying long knives used for slitting throats and skinning people". After longstanding battles especially for the northern city of Mazar-i-Sharif, Abdul Rashid Dostum and his Junbish forces alongside allied Hezb-e Wahdat forces were defeated by the Taliban and their allies in 1998. Dostum subsequently went into exile. Ahmad Shah Massoud remained the only major anti-Taliban leader inside Afghanistan who was able to defend vast parts of his territory against the Pakistan army, the Taliban and Al-Qaeda. In early 2001 the United Front employed a new strategy of local military pressure and global political appeals. Resentment was increasingly gathering against Taliban rule from the bottom of Afghan society including the Pashtun areas. In total, estimates range up to one million people fleeing the Taliban. Many civilians fled to the area of Ahmad Shah Massoud. National Geographic concluded in its documentary "Inside the Taliban": "The only thing standing in the way of future Taliban massacres is Ahmad Shah Massoud". In the areas under his control Massoud set up democratic institutions and signed the Women's Rights Declaration. At the same time he was very wary not to revive the failed Kabul government of the early 1990s. Already in 1999 the United Front leadership ordered the training of police forces specifically to keep order and protect the civilian population in case the United Front would be successful. In early 2001 Ahmad Shah Massoud addressed the European Parliament in Brussels asking the international community to provide humanitarian help to the people of Afghanistan. He stated that the Taliban and Al Qaeda had introduced "a very wrong perception of Islam" and that without the support of Pakistan and Bin Laden the Taliban would not be able to sustain their military campaign for up to a year. On this visit to Europe he also warned that his intelligence had gathered information about a large-scale attack on U.S. soil being imminent. On September 9, 2001, two Arab suicide attackers, allegedly belonging to Al Qaeda, posing as journalists, detonated a bomb hidden in a video camera while interviewing Ahmed Shah Massoud in the Takhar province of Afghanistan. Commander Massoud died in a helicopter that was taking him to a hospital. He was buried in his home village of Bazarak in the Panjshir Valley. The funeral, although taking place in a rather rural area, was attended by hundreds of thousands of mourning people. We're due. And we're due for something big. ... Some things have happened in Afghanistan [referring to the assassination of Massoud]. I don't like the way things are lining up in Afghanistan. ... I sense a shift, and I think things are going to happen. ... soon. O'Neill died the following day, when the south tower collapsed. After the terrorist attacks of September 11, 2001, United Front troops ousted the Taliban from power in Kabul with American air support in Operation Enduring Freedom, using intelligence reports offered by Iran during the Six plus Two Group meetings at the United Nations Headquarters. In November and December 2001 the United Front gained control of much of the country and played a crucial role in establishing the post-Taliban interim government of Hamid Karzai in late 2001. After the September 11 attacks in the United States in 2001, the United Front succeeded in retaking Kabul from the Taliban with air support from US-led forces during Operation Enduring Freedom. Despite fears of a return to the chaos similar to that of the 1992–1996 civil war, all the Afghan leaders met in Germany to create a new government. Hamid Karzai was chosen to lead the country and most key positions were given to Tajik members of the Northern Alliance. This created a major international issue. While Pakistan has always favored Afghanistan's major ethnic group, the Pashtun, India saw an opportunity for increasing its regional power by jumping on board with the support of the Northern Alliance in the early days of the war. With both nations seeking to increase or maintain their regional power through opposing factions on the ground, the conflict in Afghanistan has increasingly been seen by observers as a proxy-war between these powers. From 2002 to 2004 Afghanistan witnessed relative calm. By 2006, however, with the support of Pakistan, a Taliban insurgency was increasingly gaining strength. In 2010, Afghan President Karzai decided that the only way to end the Taliban insurgency is to call for peace. This process became accepted and supported by all international partners of Afghanistan, except by several key figures of the Northern Alliance such as Abdullah Abdullah, Ahmad Zia Massoud, Mohammad Mohaqiq, and others. The opposition, by then splintered into several parties, warned that Karzai's appeasement policy could come at the cost of Afghanistan's political and economic development, and the progress made in areas such as education and women's rights. As the opposition leaders were excluded from secret talks with the Taliban by NATO and the Karzai administration and Karzai's political rhetoric was increasingly adjusted to Taliban demands, United Front leaders, in late 2011, regrouped to oppose a return of the Taliban to Afghanistan. Between 1996 and 2001, the Northern Alliance blocked the Taliban and al-Qaeda from gaining control of the entirety of Afghanistan. Many internally displaced persons found shelter in areas controlled by Ahmad Shah Massoud. After the September 2001 attacks in the United States, U.S. air raids followed by ground troops of the United Front ousted the Taliban from power in Kabul. Between November and December 2001, the United Front gained control of most major Afghan cities. Had it not been for the United Front, the U.S. would have needed to deploy large number of ground troops, as was done in the Iraq War. The United Front was influential in the transitional Afghan Government of Hamid Karzai from 2001 until 2004. Notably, Mohammed Fahim became the Vice President and Defense Minister, Yunus Qanuni became the Minister of Education and Security Advisor and Abdullah Abdullah became the Foreign Minister. Most foreign observers expected this dominance to continue and for Fahim or Qanuni to be selected as Karzai's Vice President in the 2004 elections. However, Karzai instead selected Ahmad Zia Massoud, younger brother of the former United Front leader Ahmad Shah Massoud. Karzai easily won the 2004 Presidential election with 55.4% of the vote, followed by three former leaders of the Northern Alliance, Quanuni (16.3%), Mohaqiq (11.7%) and Dostum (10%). Some of the military strength of the UIF has now been absorbed into the military of Afghanistan, while many of the remaining soldiers were disarmed through a nationwide disarmament program. The existence and strength of the Afghan National Army has significantly reduced the threat of the former UIF elements attempting to use military action against the new NATO-backed Afghan government. Most of the country's senior military personnel are former members of the UIF, including Defense Minister Bismillah Khan Mohammadi. Some members of the alliance are now part of the United National Front (Afghanistan) which is led by Rabbani and includes some former leaders of the UIF such as Yunus Qanuni, Mohammed Fahim, and Abdul Rashid Dostum. The United National Front has positioned itself as a "loyal" opposition to Hamid Karzai. Others like Abdul Sayyaf claim to be loyal to Hamid Karzai while, however, following their own agenda. Abdullah Abdullah, a doctor of medicine and one of Ahmad Shah Massoud's closest friends, ran as an independent candidate in the 2009 Afghan presidential election and came in second place. On November 1, 2009, Abdullah, however, quit the runoff election because of widespread allegations of election fraud. Some of his followers wanted to take to the streets but Abdullah called for calm. Massoud Khalili, another of Ahmad Shah Massoud's close friends, became ambassador to India and subsequently to Turkey, while the younger brother of Massoud, Ahmad Wali Massoud, serves as ambassador to the United Kingdom. Massoud's ex-commander Bismillah Khan Mohammadi was chief-of-staff of the Afghan National Army, then as Minister of the Interior followed by Minister of Defense. One of Massoud's close intelligence agents, Amrullah Saleh, became director of the National Directorate of Security (NDS) in 2004 but had to resign in 2010. The National Front of Afghanistan, which was created by Ahmad Zia Massoud, Abdul Rashid Dostum and Mohammad Mohaqiq in late 2011 to oppose peace talks with Taliban, is generally considered as a reformation of the military wing of the United Front. Meanwhile, much of the political wing has reunited under the National Coalition of Afghanistan led by Abdullah Abdullah. Former head of the National Directorate of Security (NDS), Amrullah Saleh, has created a new movement, Basej-i Milli, with support among the youth. It mobilized about 10,000 people in an anti-Taliban demonstration in the capital Kabul in May 2011. Former Northern Alliance strongman Mohammed Fahim, Vice President of Afghanistan, remained in an alliance with Hamid Karzai until Fahim's death in 2014. The human rights situation during combat was heavily dependent on the specific commander and his troops. The situation for different leaders and their troops of the United Front thus shows sharp contrasts. Also, the quality of life of the Afghan population was heavily dependent on the specific leader that was directly controlling the area in which they lived. Sharp contrasts could also be witnessed regarding life and structures in those areas. Massoud created institutions which were structured into several committees: political, health, education and economic. In the area of Massoud women and girls were allowed to work and to go to school, and in at least two known instances Massoud personally intervened against cases of forced marriage. Women also did not have to wear the Afghan burqa. While it was Massoud's stated conviction that men and women are equal and should enjoy the same rights, he also had to deal with Afghan traditions which he said would need a generation or more to overcome. In his opinion that could only be achieved through education. Hundreds of thousands of Afghans fled from the Taliban to the areas controlled by Massoud. There was a huge humanitarian problem as there was not enough to eat for both the existing population and the internally displaced Afghans. In 2001, Massoud and a French journalist described the bitter situation of the displaced people and asked for humanitarian help. Until the conquest of Balkh by the Taliban in 1998, Abdul Rashid Dostum controlled the following provinces: Samangan, Balkh, Jowzjan, Faryab, and Baghlan provinces. According to Human Rights Watch many of the violations of international humanitarian law committed by the United Front forces date from 1996–1998 when Dostum controlled most of the north. According to Human Rights Watch in 1997, some 3,000 captured Taliban soldiers were summarily executed in and around Mazar-i Sharif by Dostum's Junbish forces under the command of Abdul Malik Pahlawan. The killings followed Malik's withdrawal from a brief alliance with the Taliban and the capture of the Taliban forces who were trapped in the city. With the U.S. War on Terror, troops loyal to Dostum also returned to combat. In December 2001, during the U.S. invasion of Afghanistan, between 250 and 3,000 (depending on sources) Taliban prisoners were shot and/or suffocated to death in metal truck containers. The prisoners were killed while being transferred from Kunduz to Sheberghan. This became known as the Dasht-i-Leili massacre In 2009, Dostum denied the accusations. Dostum belonged to those commanders making their own, often draconian, laws. Human Rights Watch has released documents alleging widespread crimes targeted against the civilian population. Human Rights Watch asked to actively discourage and refuse support in any way to any group or coalition that includes commanders with a record of serious violations of international humanitarian law standards, specifically naming Abdul Rashid Dostum; Haji Muhammad Muhaqqiq, a senior commander of the Hezb-i Wahdat; Abdul Rasul Sayyaf, leader of the erstwhile Ittihad-i Islami; and Abdul Malik Pahlawan, a former senior Junbish commander. ^ "Who are the Northern Alliance?". BBC News. 13 November 2001. Retrieved 11 December 2012. The alliance is primarily comprised of three non-Pashtun ethnic groups – Tajiks, Uzbeks and the Hazaras – and in the past relied on a core of some 15,000 troops to defend its territories against the predominantly Pashtun Taleban. ^ "Afghanistan's Northern Alliance". BBC News. 19 September 2001. Retrieved 11 December 2012. Until recently, the alliance's main backers were Iran, Russia and Tajikistan. ^ GUTMAN, Roy (2008): How We Missed the Story: Osama Bin Laden, the Taliban and the Hijacking of Afghanistan, Endowment of the United States Institute of Peace, 1st ed., Washington, D.C.
^ "The September 11 Sourcebooks Volume VII: The Taliban File". gwu.edu. 2003. ^ a b "Casting Shadows: War Crimes and Crimes against Humanity: 1978–2001" (PDF). Afghanistan Justice Project. 2005. Archived from the original (PDF) on 2013-10-04. ^ a b c "II. BACKGROUND". Human Rights Watch. ^ a b "BBC Newsnight 1995". Youtube.com. Retrieved February 4, 2012. ^ a b c d e f g h Marcela Grad (March 1, 2009). Massoud: An Intimate Portrait of the Legendary Afghan Leader. Webster University Press. p. 310. ^ a b c "Afghanistan resistance leader feared dead in blast". London: The Telegraph. September 11, 2001. ^ a b c d "Pakistan's support of the taliban". Human Rights Watch. 2000. ^ "Afghanistan: Arena for a New Rivalry". Washington Post. 1998. ^ a b "Book review: The inside track on Afghan wars by Khaled Ahmed". Daily Times. 2008. Archived from the original on 2008-09-13. ^ Hussain, Zahid (2007). Frontline Pakistan: The Struggle With Militant Islam. Columbia University Press. p. 49. ISBN 0-85368-769-2. However, Pakistani intelligence agencies maintained some degree of cooperation with the Taliban elements fleeing the fighting. ^ a b c d Newsday (October 2001). "Taliban massacres outlined for UN". Chicago Tribune. ^ a b c d Newsday (2001). "Confidential UN report details mass killings of civilian villagers". newsday.org. Archived from the original on November 18, 2002. Retrieved October 12, 2001. ^ a b "The Last Interview with Ahmad Shah Massoud". Piotr Balcerowicz. 2001. Archived from the original on 2006-09-25. ^ "Proposal for Peace, promoted by Commander Massoud". peace-initiatives.com. 1998. Archived from the original on 2012-03-10. ^ a b c Steve Coll. Ghost Wars: The Secret History of the CIA, Afghanistan, and Bin Laden, from the Soviet Invasion to September 10, 2001 (February 23, 2004 ed.). Penguin Press HC. p. 720. ^ "Defense Intelligence Agency (2001) report" (PDF). Gwu.edu. Retrieved 2014-02-13. ^ Bearak, Barry (2001-09-17). "Rebel Chief Who Fought The Taliban Is Buried". Pakistan; Afghanistan: Nytimes.com. Retrieved 2014-01-31. ^ "Afghanistan is a proxy war between India and Pakistan". Telegraph. Retrieved 2014-02-13. ^ "Musharraf: Afghanistan Is a Proxy War Between India and Pakistan – ABC News". Abcnews.go.com. 2011-10-06. Retrieved 2014-02-13. ^ "Afghan opposition says new parliament can check Karzai". Reuters. November 24, 2010. ^ "2010 Afghan Parliamentary Election: Checks and Balances of Power". Khaama Press. December 9, 2010. ^ Rubin, Alissa J. (2011-05-05). "Thousands of Afghans Rally in Kabul". New York Times. ^ "Anti-Taliban rally". BBC Persian. 2011-05-05. ^ "Govt Opposition Warn of Taking to Streets". Tolo TV. 2011-05-05. ^ a b "Massoud in the European Parliament 2001". EU media. 2001. ^ "Starved, hurt and buried alive in Afghanistan". Independent Online. 2002-05-02. Archived from the original on 2009-08-07. Retrieved 2009-08-07. ^ Rashid, Abdul. "'It Is Impossible Prisoners Were Abused'". Rferl.org. Retrieved 2014-01-31. ^ "Afghan Warlord Denies Links to '01 Killings". The New York Times. Retrieved 2014-02-13. ^ Zarifi, Sam (2009-07-17). "A Response To General Dostum". Rferl.org. Retrieved 2014-01-31. Wikimedia Commons has media related to United Islamic Front for the Salvation of Afghanistan (Northern Alliance).